Front of the dress. Dots are the burgundy silk velvet. The under dress is lavender purple silk with a bit of texture. Sleeves are lined with a slightly darker embroidery silk. The battle outfit from the side, and in motion. The back burgundy sack sleeves have just swung out as she moves to counter an orc blow. She uses a Rohan sword and long leather vambraces. 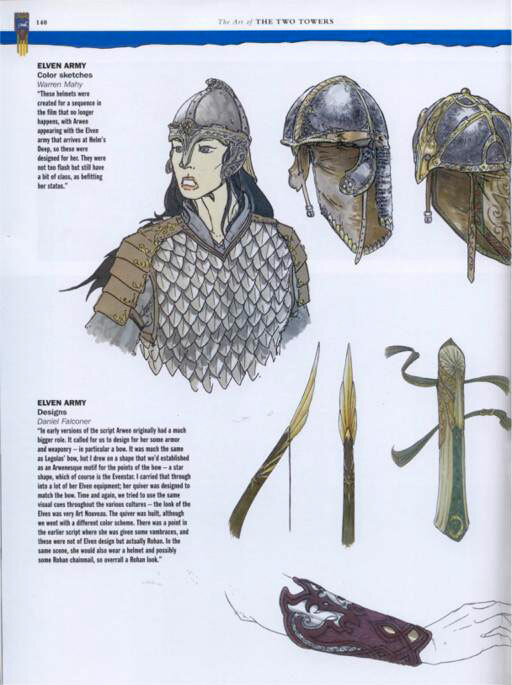 Earlier version of the TTT script had Arwen joining in the battle for Helms Deep... at least according to rumor. The final script changed and Arwen is seen only in flashback in Aragorn's memory, keeping truer to the book. So, the story line is gone, but a very lovely dress is still proof of it's one-time existence. Dark maroon velvet, sleeveless surcoat. High necked with large standing collar. The neck seam is self-piped. Small silver buttons run down the front. They close with loops. We are guessing that the gown opens all the way down the front. Sack sleeve almost look like a capelet in the back. They are tacked over the main dress just touching the collar and hanging down the sides and the back. The bodice comes to a point in front. 4 pieces, only side shaping. The skirt is probably separate like her Chase outfit and many other elfin dresses. The surcoat is split for riding. It curves up a bit in front. Don't really know if the back is trained as in the art work. Line drawing of the front of the dress with speculation that it unbuttons all the way down. Left side of the dress (with the dots) shows the dress as it hangs down. The right, shows details of the construction. Neck velvet is gathered a bit. The surcoat is sleeveless but the sleeve are sewn on down just a bit. (see the dotted lines on the insert. The sleeves are wider than they appear because of the soft drape of the velvet and the length they hang down. It does not appear that the sides of the gown are split. For battle, she wears long, dark leather vambraces. The are heavily tooled and extend up almost to her elbow. These will be in the Rohan style. As story line, they were "borrowed" from Rohan. (Lot more guessing here, but we've also seen a lot of undergowns so we should be close). The fabric has a crinkled texture and looks and flows like silk. The sleeve description presents a bit of a challenge. They are set in. However, it looks like there are two parts. The under sleeve blouses a bit at the end and can be seen fairly clearly ballooning above the vambraces . In the TV guide picture, she has another layer of the same fabric. This is looks to be a two part sleeve (but can't see the seam). Two part, because the lower sleeve, appears to have a petal wrap. The inside is lined with an embroidered fabric. There is a tight inner sleeve. The front split of the gown reveals the maroon leggings and grey boots. The shaped waist is speculation, but we've seen it on Eowyn's Refugee under gown. 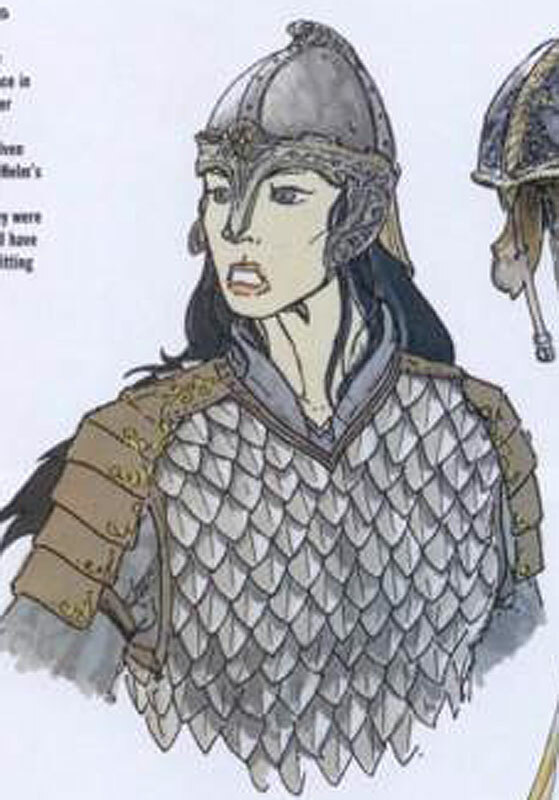 If we could see the whole costume, betting there is a chance that it would resemble the sketch in the FOTR Art book, page113, top right. They look to be the same leggings we see in the Chase Outfit. Color: a light maroon/plum. The fabric is fairly sturdy. Same boots as with her Chase Outfit. Note based on the color of Aragorn's jerkin, this pic has been lightened quite a bit. can see the side opening, not a curved armscye. Sleeves look like they might be two part. How the heck does the top sleeve/capelette work??? It's over her arm here, but you can also see bits of the underdress under her arm... so it's not a full double sleeve. Sides of skirt look to be just one piece. So, probably only split front and back. can see bits of the skirts and the sleeves. Fabric looks like velvet and silk when seen here... which matches the guesses. just bits of fabric again.